This spectacular Texas Motor Speedway All Inclusive RV Rental Package begins noon on Thursday and goes through Monday. All times are EST. Must depart on Monday by 9:00AM. Motorhome Details: Please see the Motorhomes section for specific details of the RV of your choice. 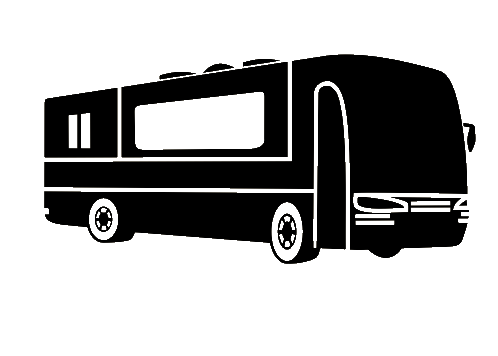 Standard Amenity Packages Include: All Motorhome transportation cost to and from Speedway and all set-up & take-down functions. Motorhome cannot be moved off the Speedway property. Must obey the Speedway rules and regulations. Unlimited generator usage, fuel usage and LP gas usage. 1 six foot table, 6 chairs, patio carpet, Weber gas grill, utensils and one large cooler included. Also, includes your overnight bedding, fresh sheets, blankets, pillows, and towels. 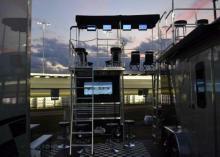 All Motorhomes will have Satellite TV for race viewing unless reception is unobtainable. 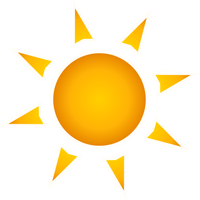 Rental Rates: Rates will vary pending your Motorhome or Entertainment trailer choices, your Speedway destination and type of preferred camping site - infield "wall" sites or outside sites. 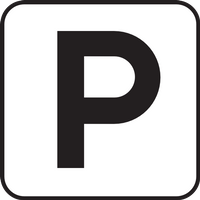 All rental rate packages will be developed for you exclusively. Payment must be made via Company Bank Check, Cashier Check, Money Order, PayPal with 3% processing fee added to total, or Bank Wire Transfer. Must sign a standard Motorhome rental agreement prior to occupancy. Must have a valid driver's license and be at least 25 years of age. A $1000.00 refundable security deposit will hold this Motorhome rental. No refunds with less than 90 days cancellation. 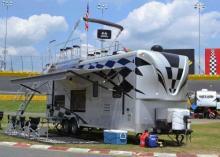 This Motorhome cannot be moved or leave the Speedway property. Rental sales tax will be added to all rental rates. Similar All Inclusive Speedway Travel Packages will be offered in 2019 at the following Speedway locations - Talladega, Atlanta, Michigan, Bristol, Darlington, Martinsville, Chicago, Kansas, Homestead, Texas and Daytona. 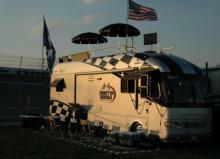 We specialize in the development of Motorsport Events such as Nascar, IRL, and other rv rental packages. Feel free to call us regarding any of the above Rental details at 1-800-917-7511 or email us with your request at info@trinityrvrentals.com. This would be a great incentive opportunity for your employees and customers! 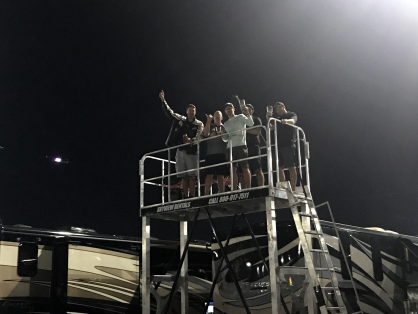 Book early to hold your 2019 All Inclusive Texas Motor Speedway Vacation Packages with Trinity RV Rentals, LLC. 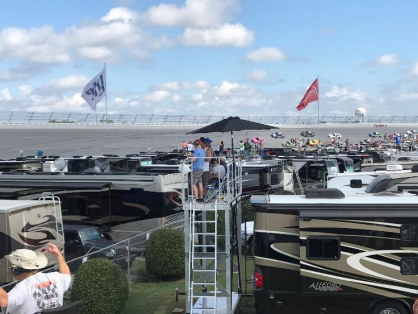 Class A Motorhome all inclusive infield camping packages at Texas Motor Speedway for the O'reilly Auto Parts 500 and the AAA Texas 500 races. Your RV package will include your very own wall spot between turns 1 and 2. Our class A Motorhome packages are designed to accommodate up to 6 guest comfortably, and each includes our standard amenity package for you to enjoy your stay with absolutely no worries and everything you need to make this a experience you will never forget! 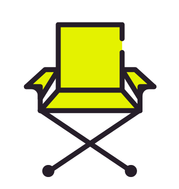 Entertainment Trailer all inclusive infield camping packages at Texas Motor Speedway for the O'reilly Auto Parts 500 and the AAA Texas 500 races.. Your Entertainment Trailer camping package will include your very own wall spot between turns 1 and 2. Our trailer packages are designed to accommodate up to 6 guest comfortably and include our standard amenity package for you to enjoy your stay with absolutely no worries and everything you need to make this a experience you will never forget! 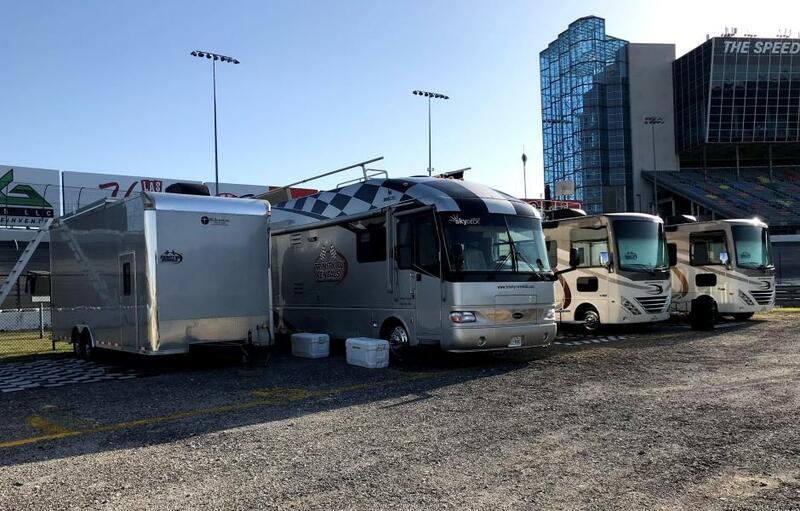 Fifth Wheel Trailer all inclusive infield camping packages at Texas Motor Speedway for the O'reilly Auto Parts 500 and the AAA Texas 500 races. Your Trailer Camping package will include your very own wall spot between turns 1 and 2. Our class trailer packages are designed to accommodate up to 4 guest comfortably and include our standard amenity package for you to enjoy your stay with absolutely no worries and everything you need to make this a experience you will never forget! Skyview infield packages at Texas Motor Speedway for the O'reilly Auto Parts 500 and the AAA Texas 500 races. With Each rental This New Observation System Will Be Delivered Set-Up And Removed By A Trinity RV Field Specialist. 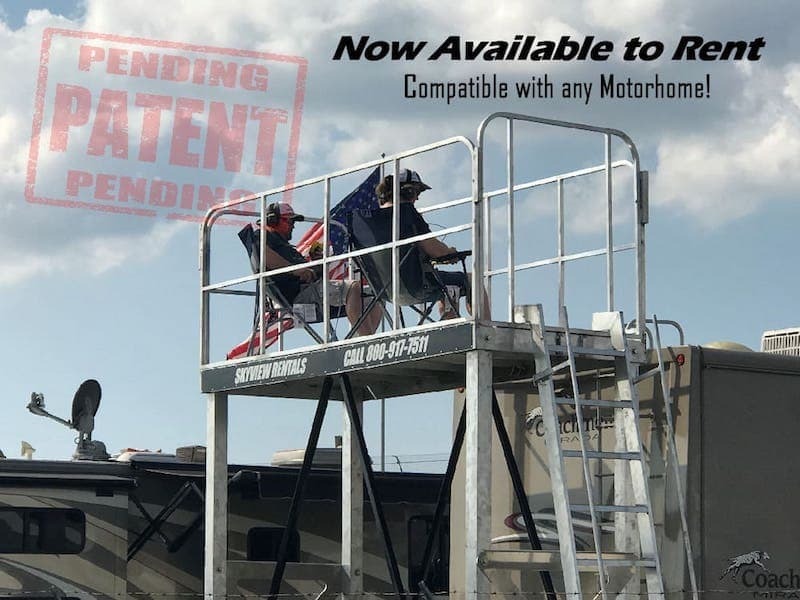 Our Skyview System Stands flush with the roof of most class a motorhomes, Has Safety Rails Completely Around The Viewing Area, And A Custom Made Ladder With Hand Rails To Ease Your Up And Down Access. We Permanently Attach This New System To Your Motorhome via the hitch, And it Cannot Be Removed Until After The Main Event. Our Skyview Observation System Is Perfect For Up To 6 Guest. We want you to enjoy your View in a safe manner with absolutely no worries and everything you need to make this a experience you will never forget! Skybox all inclusive infield packages at At Texas Motor Speedway For The O'reilly Auto Parts 500 And The AAA Texas 500 Races. This Unique Concept Is Made To Accommodate 6 Guest At One Time And Provides Them With A Trackside Experience Like No Other. 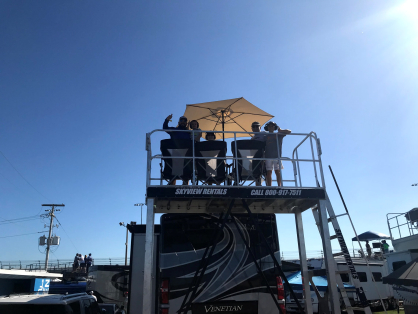 All Of Our Skybox Packages Typically Can Be Paired Up With A Class A Motorhome Or A Class C Motorhome And Placed In The Rear Of The Vehicle Up Along The Fence. All Setup Functions As Well As Take Down Functions Are Performed By Are Staff At The Track. Your Skybox Will Include Rooftop Viewing For Up To 6 Adults. The Viewing Area Contains 4 Televisions And Two Speakers To Watch And Listen To The Race When You Lose Sight Of The Cars Going Around The Track. 10 Chairs Come With The Package, 6 Up Top And 4 Down Below. A 55" High Definition Television Is In The Lower Viewing Area For The Entertainment Of Those Below On The Ground. Our Skybox Systems Come Equipped With Satellite Tv And A Audio Sound Bar With Two Additional Speakers.